No matter where in the world you live, it rains. Well, OK, perhaps not very often in the Sahara desert, but in most places it rains regularly. In some places, such as the Amazon rain forest it rains almost all the time, but even in London and Manchester, Birmingham and Glasgow, we have our fair share of rain, and if you don't want to get wet you will need an umbrella. If you have an umbrella, you will also need somewhere to store it when you arrive at the office or back home. If it hasn't been raining that is not too bad because it will be dry, but if it has been pouring down it is going to be wet. Either way you need an umbrella stand that will hold not just one or two umbrellas, but as many as four (one for each of the family) and won't let your wet umbrella sit there dripping on to the carpet. At Contemporary Heaven we have a choice of umbrella stands including some from Umbra, from Blomus, and from Kartell. Umbrella stands used to be boring rectangular designs which were created purely to be functional, which to some extent is fair enough, but today we are in the 21st century and we want something which is not only functional but looks great as well. One umbrella stand which is great fun – and very cheap by the way – is the Balvi Splash umbrella stand. This only holds one umbrella and is in a bright orange/red colour which sits on the floor. When you put your umbrella into it the Splash makes it look as though your umbrella is dripping red paint on to the floor. It does only hold one umbrella, but you could always buy more if you need to. One that we really like is the one which looks exactly like a pair of riding boots. Made from a thick resin, it looks as though you just got off your horse and took off your boots inside the hallway. In fact, if you did just get off your horse, you could also use it to store your crop! Another design is one that is made to look like people, each holding an umbrella. 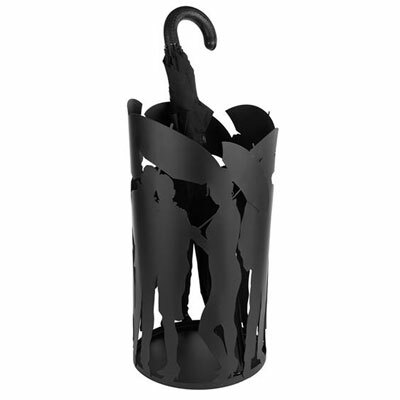 Made out of a black metal, this umbrella stand will easily hold three or four umbrellas and won't let them drip on to the carpet.